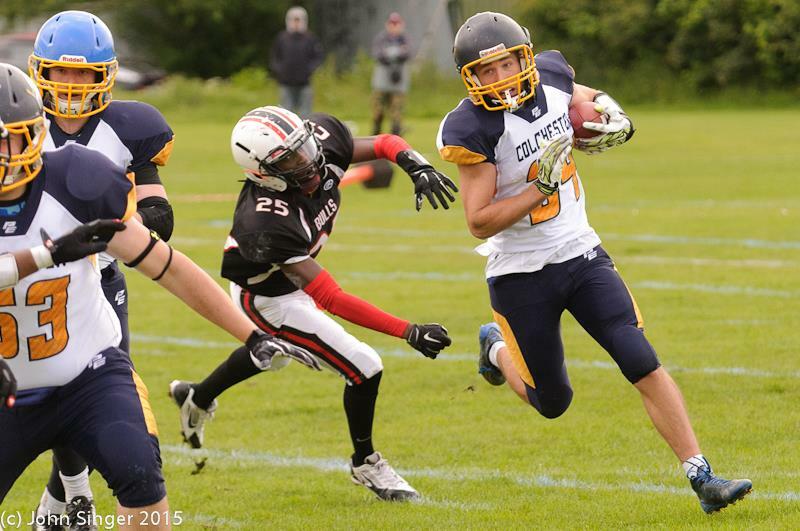 The Colchester Gladiators improved their record to 2-2 with their second consecutive win, when they travelled to Birmingham and outlasted the Bulls, edging a titanic defensive battle by nine points to seven. With each of the top teams beating each other, the Gladiators have kept themselves in with a chance of a postseason playoff spot. 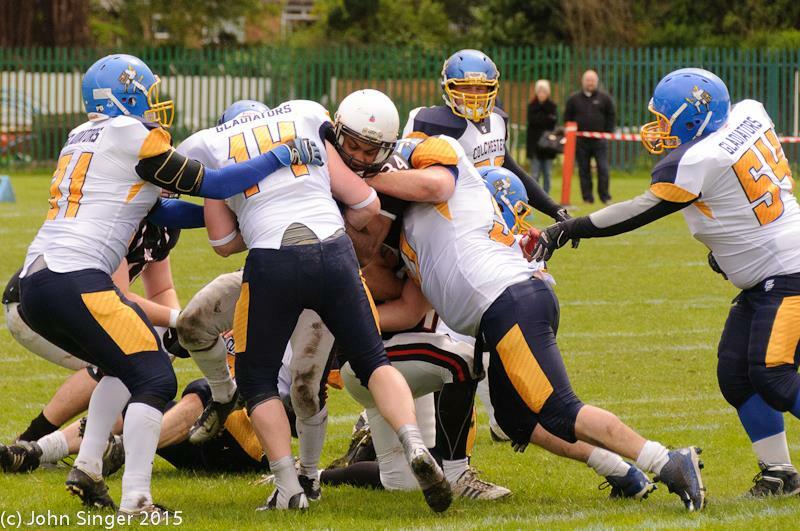 The Bulls entered the game as two score favourites after defeating the Farnham Knights two weeks previously who inflicted the Gladiators’ second defeat of the season. 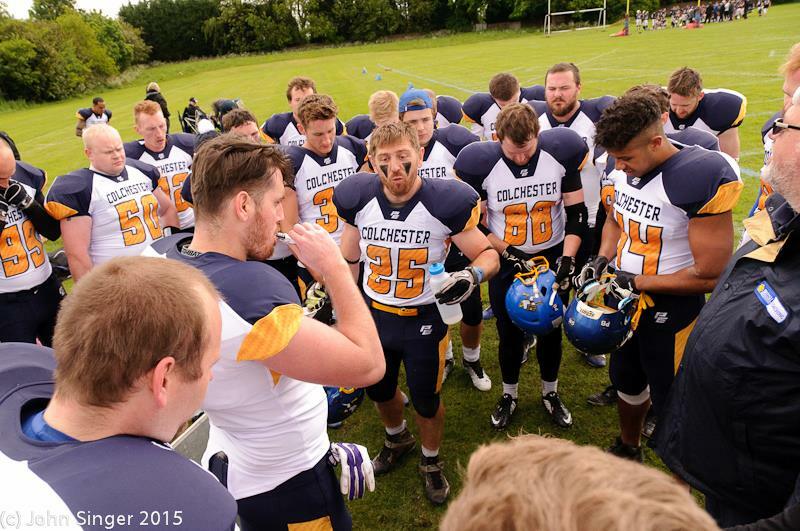 However, confidence in the Gladiators’ camp was high after an excellent win against previously unbeaten Ouse Valley Eagles. The Bulls started well, taking the opening kick off and driving into the visitors’ half but Joe Wilson tackled the Bulls running back for a five yard loss and they had to punt. 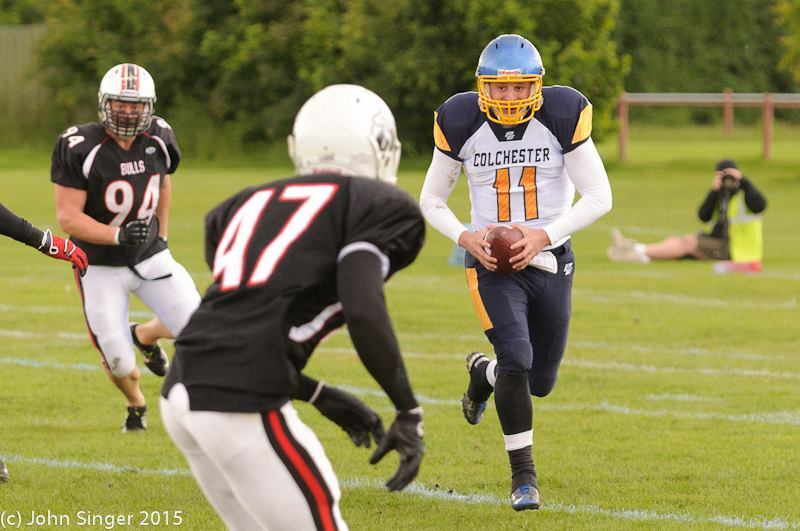 Colchester’s offence struggled to find its rhythm early, failing to pick up a first down on all three possessions in the opening quarter, and could not take advantage of a poor snap on a punt attempt, when Ian Digby recovered the loose ball, and the teams changed ends at the start of the second period still scoreless. 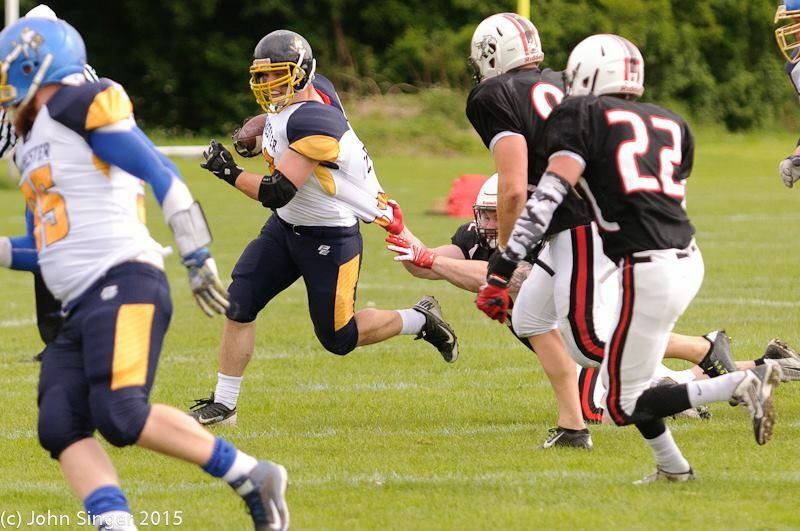 First downs continued to be elusive for both teams but the Gladiators defence, led by Josh Milgate, refused to bend and after a Sam Gennings punt, the Bulls were forced to start on their own five yard line. Milgate continued to be a thorn in the Bulls’ side, dropping the running back in the backfield for a five yard loss before a bad snap on fourth forced the punter to run. 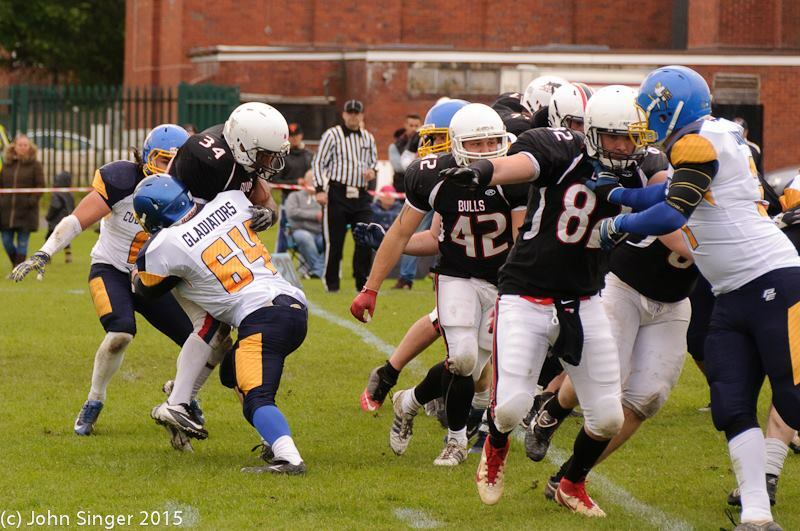 Nik Phillips made the stop short of the first down marker and the Gladiators took over in excellent field position. They could not take advantage initially when Nathan Brown’s field goal attempt was wide right but another poor Bulls punt only reached their own 22 to give the Gladiators a short field as time was running down. Gladiators’ QB Curtis Bourke found first Vic Williams then Casey Campbell for a first down before finding Williams again, at the back of the end zone, and the sure handed receiver made no mistake, holding on to the ball while also just getting his feet in bounds for a touchdown. Brown’s PAT was good and the Gladiators entered half time leading 7-0. The Gladiators received the ball to start the second half but after a good return by Sam Huxtable, Gennings was called upon to kick the ball away. A good chase by Joe Stickings saw the ball downed on the four and after more good work by Wilson and James Birch, the Bulls head coach had no option but to punt again. This time, the poor snap went way over the punter’s head out the back of the end zone, resulting in a two point safety for the Gladiators, taking the score to 9-0. After a safety score, the conceding team also is required to kick off but a good kick prevented the Gladiators from benefitting from possession and field position, starting their drive after a penalty, on their five. They could not take advantage, returning the ball to the Bulls who got right back into the game just two plays later. A screen pass to the Bulls running back saw him evade a couple of tackles before emerging into open field, taking the ball all the way into the end zone. The extra point was good to make the score 9-7. Worse was to follow as the Gladiators fumbled away possession on their next play giving the Bulls the ball inside the Colchester half. 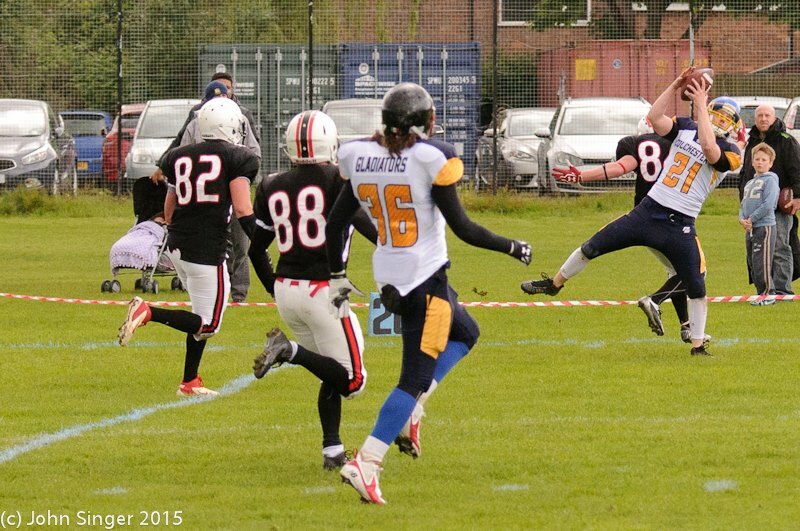 However, cornerback Sam Gennings spectacularly intercepted the Birmingham QB to rescue his team. Gennings repeated the feat on the Bulls’ next drive as they took to the air to try to penetrate the stingy Gladiators’ defence and the fourth quarter began with the Gladiators in possession. Still neither side could string two first downs together and the tension grew as time ticked away. The Gladiators defence continued to make plays to keep the Bulls at bay, not letting them out of their half and “Chewy” Henson threw a Bulls running back for an eight yard loss before Gennings secured his third interception of the half inside the two minute warning. 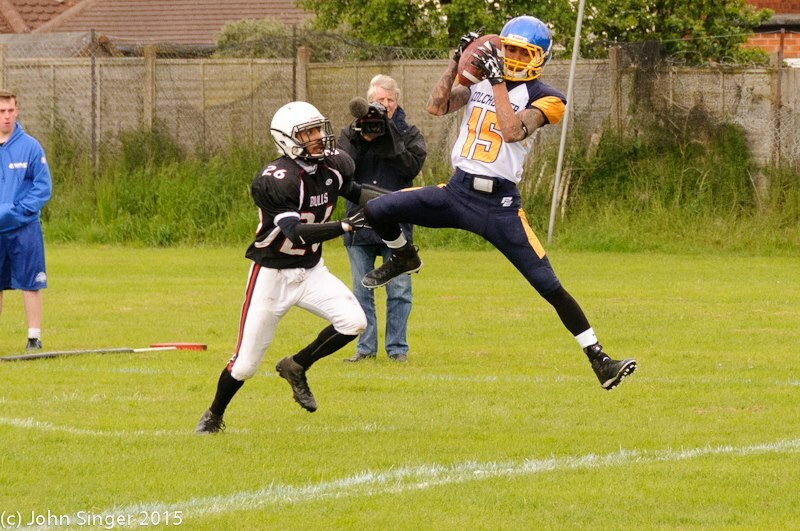 The Bulls had one final chance to steal the game but three consecutive incompletions followed by a sack by Milgate secured the win for the Gladiators and keep their playoff aspirations alive. 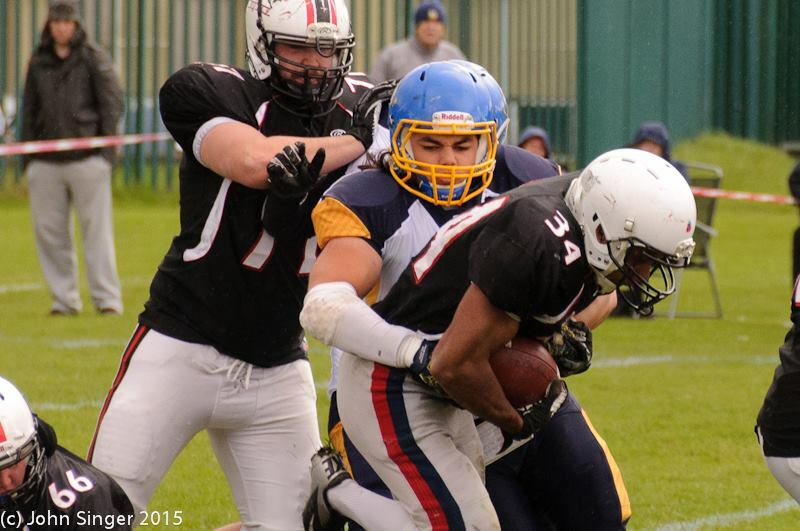 They travel to Watford this weekend to take on the 2-3 Hertfordshire Cheetahs. 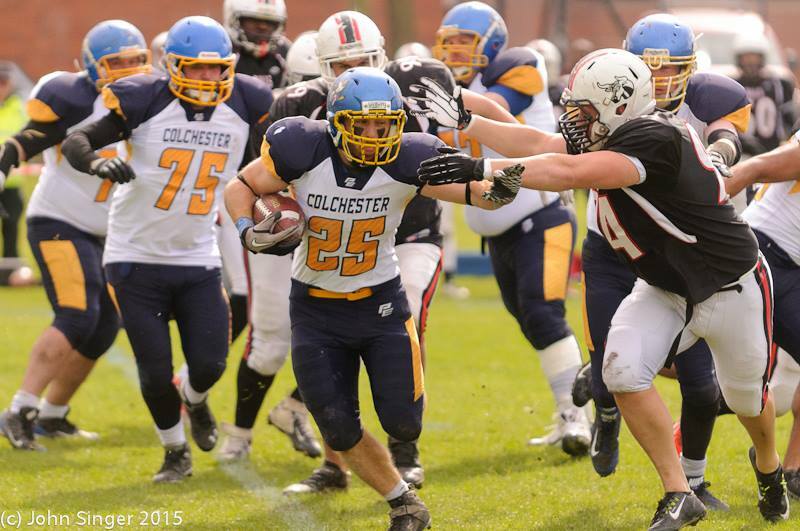 All home games will be played at Colchester Rugby Club, Mill Road, Colchester, kick off 2.30pm.